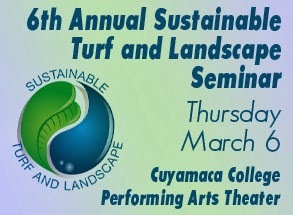 A national expert in golf course environmental stewardship is a speaker for Cuyamaca College’s 6th Annual Sustainable Turf and Landscape Seminar set for Thursday, March 6. Cuyamaca College, renowned for its longtime commitment to the green movement, began hosting the seminars as a forum for educators, industry representatives and local organizations interested in fostering a culture of sustainability. The event is put on by the college’s Ornamental Horticulture program. Nearly 100 local artists, including Grossmont College art faculty, have donated their own artwork to “100 x 100 – Artists for Healing,” a benefit to raise money for the American Cancer Society that takes place from 7 – 9 p.m., March 14, in Hyde Art Gallery. The gallery is located at Grossmont College at 8800 Grossmont College Drive in El Cajon. Each artist had the option to dedicate their donated piece in honor of someone affected by the disease. Event attendees will be able to select a piece of art to take home after donating $100 prior to or at the event. Cash or check donations will be accepted at the event, as is proof of an online American Cancer Society donation made prior to the event. Pressnall helps students Jamie Brown and Dana Schneider. The Office Professional Training (OPT) program at Grossmont College has received an AARP Foundation grant of nearly $108,000 to help unemployed women 50 and older obtain high-demand jobs. The BACK TO WORK 50+ initiative was launched as a pilot program in 2013 in Denver, Colo., and AARP Foundation expanded the program in January with a new partnership with the American Association of Community Colleges. 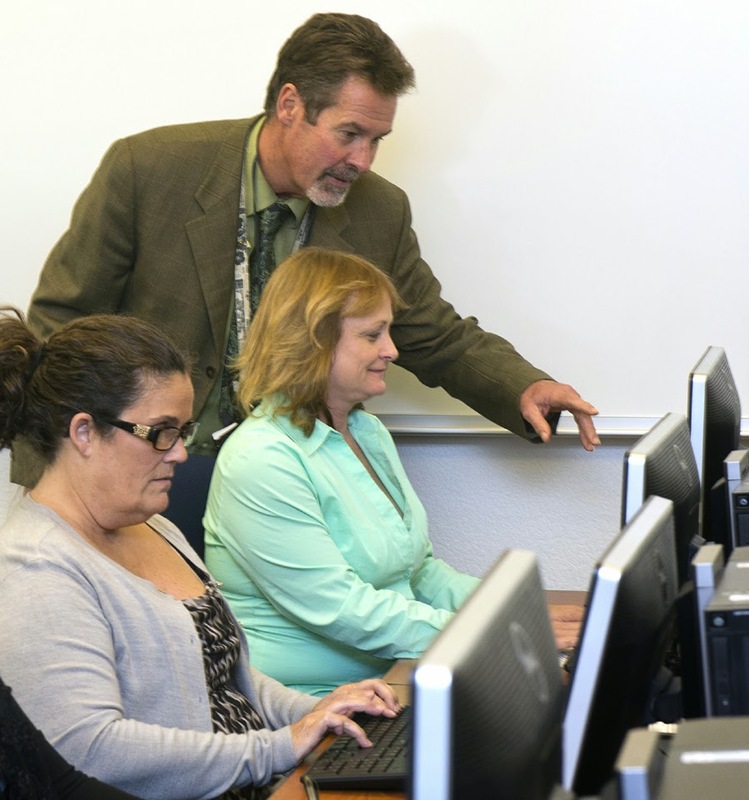 A dozen colleges and college districts across the nation were selected as the first to participate in the expanded program, with the Grossmont-Cuyamaca Community College District as the only one in California. Three more colleges will join the network later this year. With support from the Walmart Foundation, AARP Foundation has committed $2 million to BACK TO WORK50+ which has so far provided 2,000 people with resources and information to find good jobs in their communities. As an African-American college dean, Marsha Gable knew she was taking a risk focusing on the touchy topic of race in her doctoral dissertation in 2011. But what resulted is a fascinating, intensely personal account of seven black women who managed to beat the odds to become CEOs in the state systems of public colleges and universities. The Cuyamaca College dean of counseling services since early 2013 gave a recent presentation, “Our Roots are Deep: Living Life from the Core,” as part of the campus’ commemoration of Black History Month. Her research pointed to a huge deficit of leadership by black women at the state’s community colleges and universities. Gable’s research in 2010-2011 showed 28 African-American women possessed doctorates in senior and executive positions: 22 at community colleges; two at the California State Universities and four at the University of California campuses. Gable, who received a doctorate in education from San Diego State University, reached out to all 28 college leaders to participate in her study. She calls the group who participated the “Seven Wise Women,” who each agreed to interviews, field observations and journals chronicling their day-to-day activities. 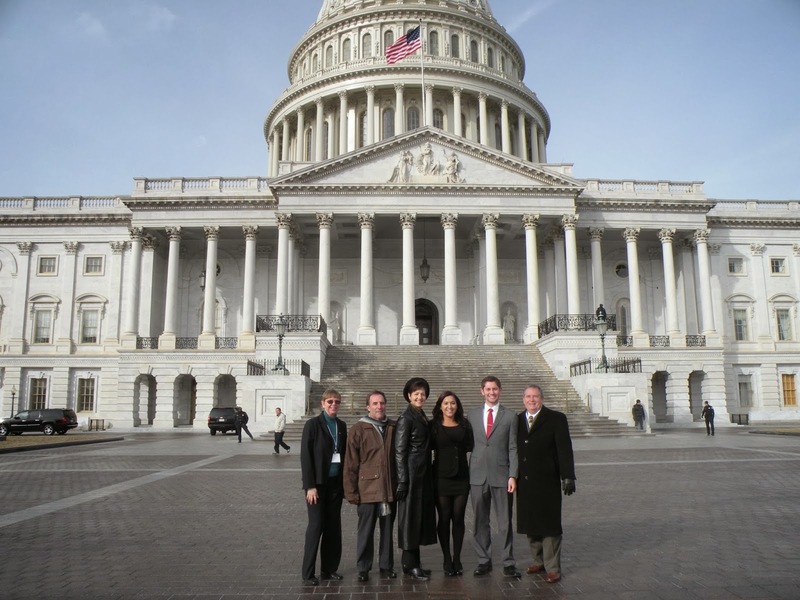 A contingent from the Grossmont-Cuyamaca Community College District recently visited Washington, D.C. to participate in the ACCT National Legislative Summit and advocate with their federal legislators for support of community colleges. Members of the group were Chancellor Cindy L. Miles; Governing Board President Bill Garrett; Governing Board Vice President Edwin Hiel; Student Trustees Zack Gianino and Elsa Hernandez; and Communications and Public Information Director Anne Krueger. 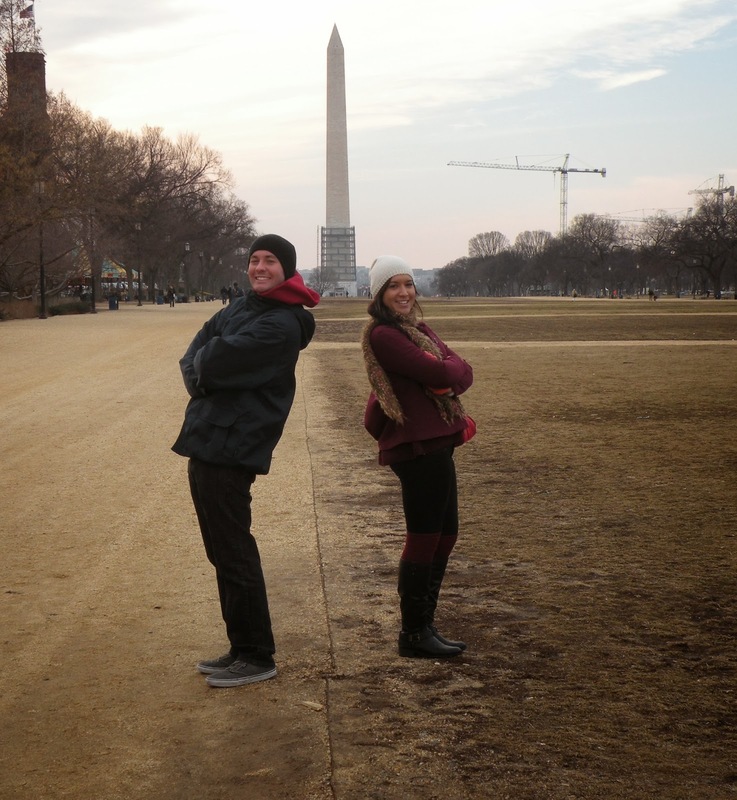 It was Zack and Elsa's first trip to Washington, in a trip that was made more memorable when a foot of snow fell on Washington and crippled the city. They had a chance to spend a few hours touring the U.S. Capitol and exploring some of the museums on the Mall. The group met with Reps. Duncan Hunter, Susan Davis and Juan Vargas, Sen. Barbara Boxer and a staffer for Sen. Dianne Feinstein. The ACCT group also heard from Sens. Marco Rubio, Tim Scott, Lamar Alexander, Charles Schumer and Elizabeth Warren. That is the slogan of the 2nd Annual Homecoming Event for Retirees, a Feb. 20 get-together for former employees of the colleges and district, a resource of about 400 potential volunteers that the foundation would like to tap for a host of college events and programs. Set for 2-6 p.m. at Grossmont College’s Griffin Gate, the event is free to retirees and guests, and includes faculty presentations, tours of the high-tech facilities funded by the 2002 Prop. R construction bond measure, a wine and hors d’oeuvres mixer, and an update by the foundation on upcoming retiree events. Business leaders from nearly a dozen local companies and organizations attended a recent launch of the Grossmont-Cuyamaca Community College District’s partnership with Global Corporate College, a higher education network ready to help corporations train their workforce to meet today’s needs. Among the attendees Tuesday at Cuyamaca College were representatives of companies including Helix Environmental Planning; Gafcon Inc., a construction consulting service; Silvergate Bank; Kaiser Permanente; Ken Blanchard Foundation, and Cummins Pacific, the West Coast distributor for engine maker Cummins, Inc.
GCC founder and president Denise Reading said the customized training offered by the network of community colleges provides the flexibility to quickly and efficiently conform to market demands. Grossmont and Cuyamaca colleges received the welcome word today that they earned the highest level of endorsement by the Accrediting Commission for Community and Junior Colleges. The accrediting committee’s seal of approval - formally referred to as a six-year “reaffirmation of accreditation” – was issued following its biannual meeting in January to consider accreditation applications. Separate evaluation teams visited both colleges for a week last October to prepare their recommendations to the commission. Grossmont College’s team complimented the college for the transformative changes that had occurred since the last accreditation in 2007. Cuyamaca College was praised for its student-centered focus and its high level of student engagement in governance and the decision-making process. It’s a record that short-track speedster Apolo Ohno would envy. OK, so it isn’t the Sochi Olympics. But a decade run of spotless audits has Grossmont-Cuyamaca Community College District officials ready for a victory cartwheel, the signature move of alpine skier Tina Maze. The five separate audits presented last week to the Governing Board cover the district’s general audit; its part-time employees’ pension plan; the Foundation for Grossmont and Cuyamaca Colleges, the district’s auxiliary, and Proposition R, the construction bond fund approved by East County voters in 2002. The district’s stretch of what’s known in the accounting lexicon as unmodified, or flawless, audits is quite an accomplishment, said Chancellor Cindy Miles. To honor the movements, traditions and legacies of peoples of the African diaspora, Grossmont College will host a variety of educational and entertainment events throughout February as part of Black History Month. All events are free and open to the public. To find a complete listing of Black History Month events, visit Grossmont.edu. For additional information, contact Student Affairs at 619-644-7600. Grossmont College’s Black History Month activities are organized by the Black History Month Planning Committee and sponsored by the World Arts and Cultures Committee. Diversity awareness continues to be a goal at Cuyamaca College, where Black History Month includes a forum on African-American women leaders, and the return of the semester-long workshop series, Diversity Dialogues. 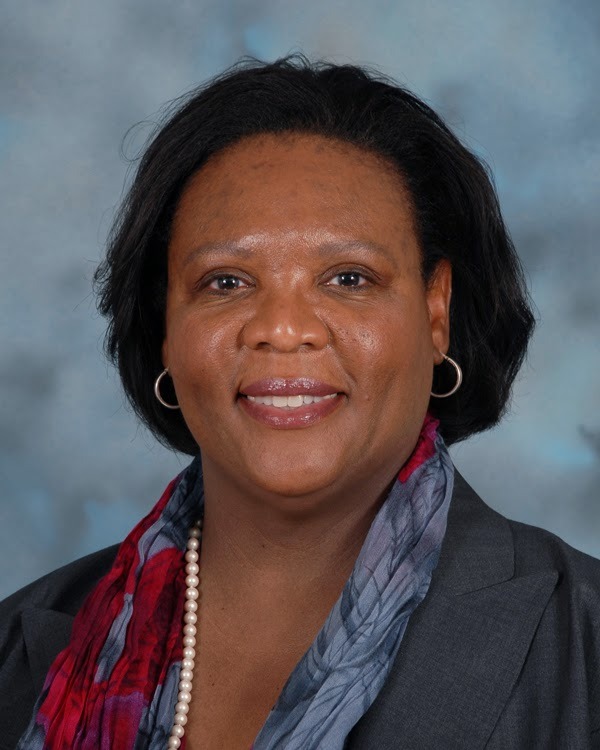 Marsha Gable, dean of counseling services at Cuyamaca, will present “Our Roots are Deep: Living Life from the Core,” a Tuesday, Feb. 11, symposium exploring black women leaders’ paths to career and personal success. “Driven by the values of relationships, family, spirituality and equality, African-American women are poised to succeed and enjoy life from the core,” Gable states in a publicity flier for the workshop set for 11:30 a.m.-12:30 p.m. in room I-207 in the student center. Also a part of Black History Month, a display marking the 50th anniversary of the Civil Rights Act of 1964 is set up on the first and second floors of the campus library. Cuyamaca’s observance of African-American history continues with a lively step-show performance Tuesday, Feb. 25, by the San Diego State University chapter of the predominantly black Phi Beta Sigma fraternity. The 2 p.m. dance performance will be at the student center quad.